Since going to my “local” – The Empire Bay Tavern – and asking the Manager – if he’d be interested in coordinating a Flood Fundraiser – and receiving a resounding – yes – the response since word “got out” has been immense. Businesses and individuals have all volunteered everything from products for raffles; their time to assist on the day to helping spread the word. We’ve set a date and the details regarding the day and raffle prizes are below – make sure you book-mark this page as we’ll be updating it frequently as more prize and event details are updated. 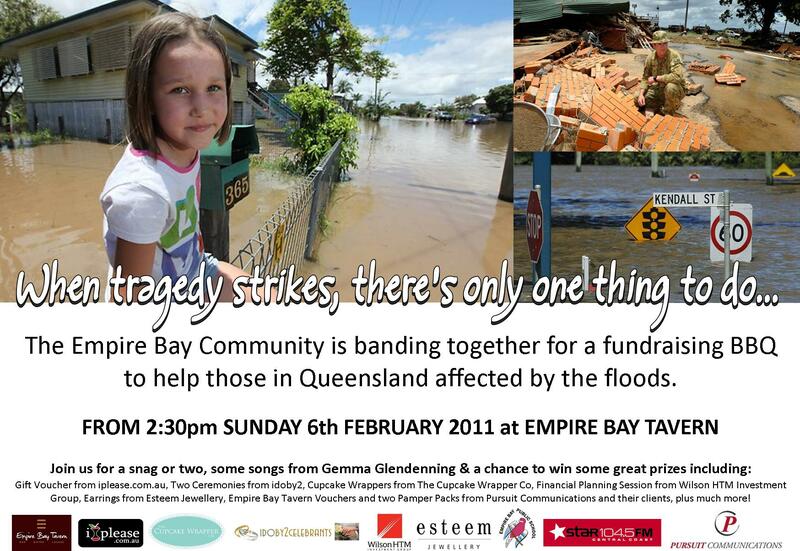 The Empire Bay Community Flood Fundraiser will be held on 6th February from 2.30pm. There’ll be a BBQ, songs from Gemma Glendenning and raffles throughout the day. A *HUGE* thank-you to those individuals and businesses who have donated prizes.